Thermaltake Vi-ON external hard drive enclosure is the world’s first external enclosure with embedded hard drive suspension system and Active Smart Cooling System. 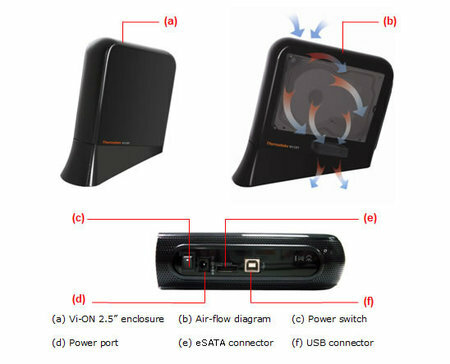 It utilizes a temperature sensing fan that reacts to hard drive temperature and changes fan speed in real-time for utmost efficiency and silence. While most users do not realize, hard drives are capable of producing a fair amount of vibration when hard drives are at their maximum rotation speed. That is exactly why Thermaltake engineers designed-in the world’s first HDD suspension system to minimize those vibration noises. Vi-ON’s unique outer tilted structural design along with eccentric metal mesh makes it visually pleasing to be placed anywhere in home. 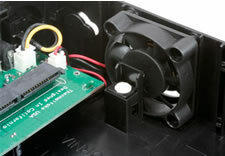 The removable base unit can be detached for effortless transport. The 3.5” SATA HDD enclosure in elegant glossy black finish measures 255 x 70 x 205 mm and weigh 480g. Standard accessories include USB 2.0 Cable, eSATA Cable, Power Adapter and Dust Cloth.